Drive a dream car on a race track in Las Vegas during this 2.5-hour, muscle-car driving experience. 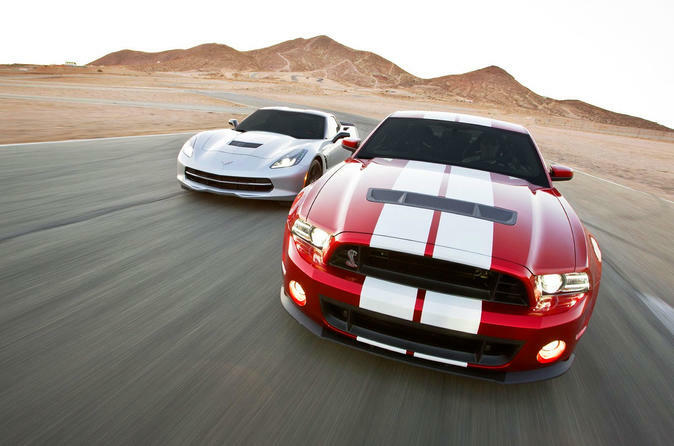 Get behind the wheel of a Corvette Z06 and the Shelby GT on an exclusive, 1.5-mile race track with no speed limit. This experience includes ten laps, five laps in each car. Includes safety gear and a professional coach. Bring driving fantasies to life behind the wheel of a dream car on a race track in Las Vegas. Upon arrival at the track, it's easy to see this will be an experience unlike any other. On South Las Vegas Boulevard, just 10 minutes from the famous 'Welcome to Las Vegas' sign, this 100-acre speed complex features a multi-level welcome center, observation decks, cafe, meeting spaces, an event center accommodating thousands, and a track inspired by Formula One racetracks with rising elevation changes, sweeping turns and a half-mile straightaway which compares to the top circuits in the world. The masterfully designed course is fully lit for after-dark experiences and events. You'll be able to drive both a Corvette Z06 and a Shelby GT 500 Mustang. The Corvette's performance abilities are outstanding — especially with braking, turn-ins, and corner exits — thanks to race-grade aerodynamics, It has more down force than any GM car ever produced. Of course, that can be easy to forget when roaring down the half-mile-long front straight at triple-digit speeds. The Shelby GT is born of beefy, historical stock. The GT’s supercharged, 5.8-liter V8 churns forth 662 horses and 631-pound feet of torque, which is an absolutely incredible amount of force. Professional coaching, plus insurance, and the use of a safety helmet are provided. Select Las Vegas hotel pickups and drop-offs are included.